SAGA's introduction of the Steppe Nomads into the recent expansion has opened up a number of figures I have acquired from my years of gaming with Byzantines. 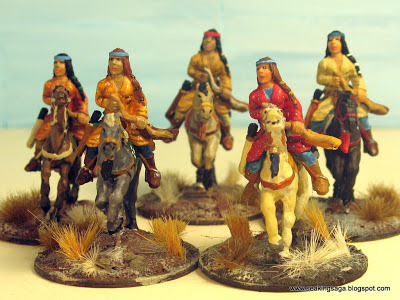 While not as numerous as Vikings, Saxons and Normans, SAGA gamers can find a number of steppe figures that can fit into the early medieval period. The Khazars, probably a Turkic people, were for a time the dominant power on the southern Steppes in the early medieval period. In the ninth century, the nobility converted to Judaism, probably as a way of trying to balance relations with both the Christian Byzantines and the Islamic Abbasids. At the same time, they were dealing with territorial challenges from the Rus to their north and Pecheneg Turks migrating through their lands. The Pechenegs became something of a player or a pawn in the ambitions of the Rus, Khazars and Byzantines on the southern steppe. Pechenegs in the service of the Byzantines killed Sviatoslav I of Kiev and, as typical of the times, turned his skull into a drinking goblet. Old Glory's pack of Pechenegs has 10 figures in 5 poses. Additionally, the bodies are in two pieces - an advantage for those wishing to convert or customize. I found it to be too much work, with large gaps that needed filling. Another group of minor Turks that came to play a significant role in the history of the Middle East was the Seljuk Turks. They migrated from the central Asian steppes through Khurasan and Persia, defeating the Ghaznvids. They also formed the core of the Ghulams, heavy cavalry in service to the Abbasid caliph, where they exerted increasing control over the titular head of the (Sunni) Muslim world. Light Turkic cavalry, or Turcomans, carrying bows and short swords, employed the traditional steppe tactics of hit and run and feigned flight to wear down heavier armed enemies. 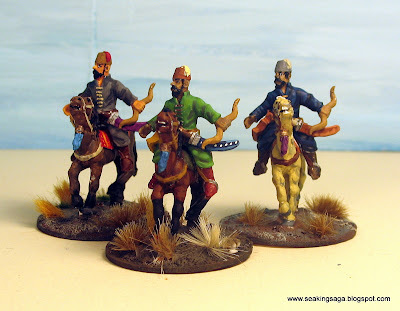 Magister Militum's Turcomans (below) are nicely designed and affordable, but a pack of twelve comes in only two poses, one male and one female. Early Turkic warbands (prior to twelfth century) might have included female horse archers as well. Accounts of female mounted warriors are well attested, stretching back to Herodotus' descriptions of the Scythians. I have become interested in the similarity in the response between the Byzantine Empire and the medieval Chinese dynasties to incursions from the steppes. Their strategies were similar in many ways. For centuries, the two empires alternately favored one tribal group over another, while adapting and using mounted archers in their imperial forces. Similarly as well, it was finally a losing game, as the Turks eventually overwhelmed the Byzantines and the Mongols finally conquered Song China. The Jurchen were a Tungusic tribe dominated by the Khitan Liao Dynasty (907-1125). The Song Emperor made the mistake of favoring the Jurchens over the more settled Khitans. After the Khitan's defeat by the Jurchens, they turned on the Song and seized the northern capital, imprisoning almost the entire Chinese royal family. 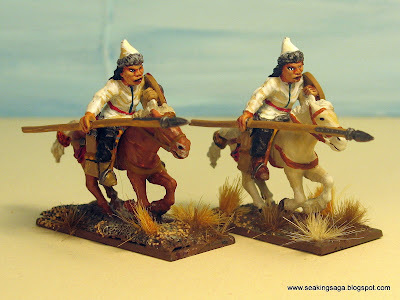 These Jurchen figures are from Essex's extensive line of medieval Asian historicals. Expect to see more of these on a China/Asia SAGA mod that I am working on currently. 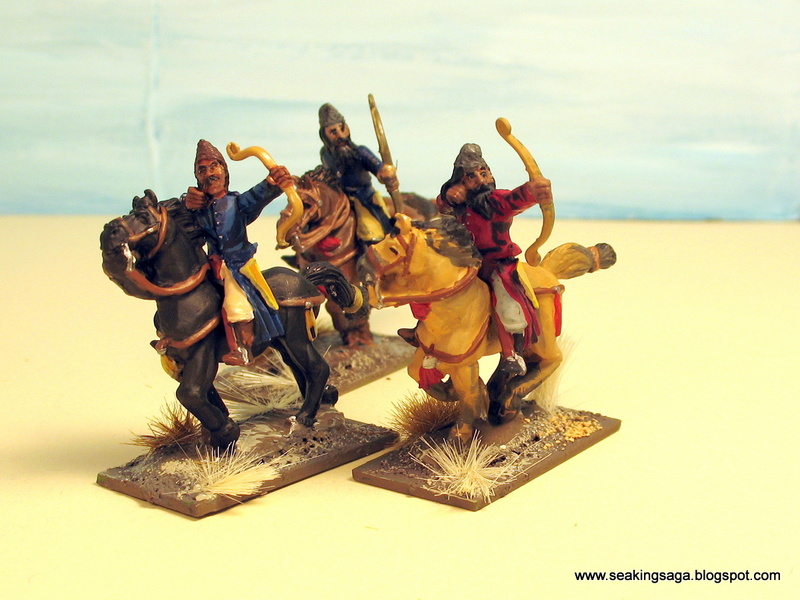 Two new ranges of Mongols are forthcoming. 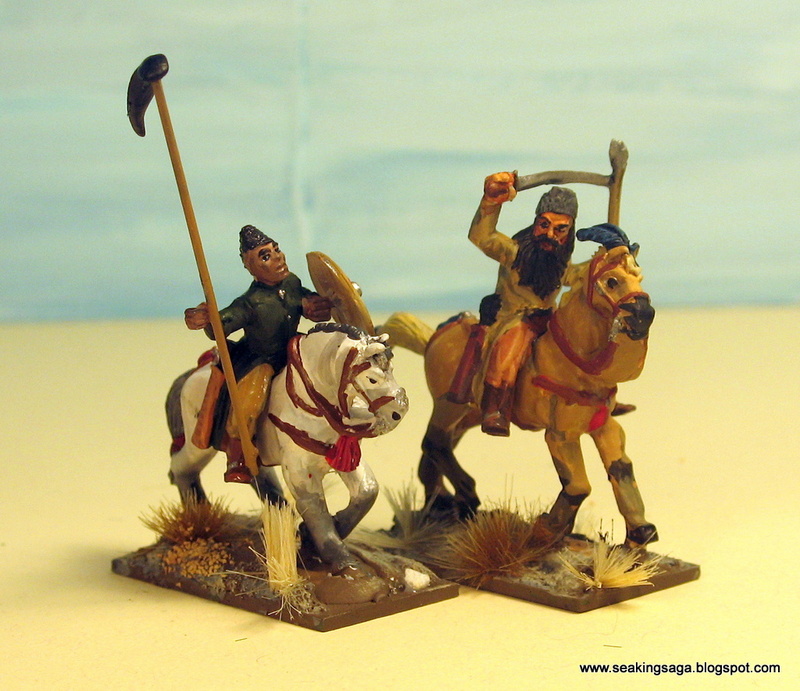 Fireforge is producing a set of plastic Mongols for their Teutonic/Baltic range. I think they are great looking, but the horses are a bit too large for Mongol steppe ponies. Of course, if these are Golden Horde Mongols from the thirteenth century and on, they might have larger western horses. Gripping Beast's newletter also included a pic (below) of their new Mongol line. While it is also intended as an opponent for their Teutonics, the smaller horse and less ornate detailing could allow its use in earlier settings.